Is The Riddler Arkham City's Scarecrow? If there is a new Batman video game coming out in the fall called Batman: Arkham City, could you imagine it not including The Riddler? OK, you detectives, if the Riddler was getting an expanded role in the game what would it be? What was Batman doing during the end of a recent demo I saw of his new game, back in San Francisco during the Game Developers Conference? Any ideas? Try this one: What looks like a bat, crouches on a roof and tunes some sort of Bat-gadget into frequencies that let him hear where Riddler clues might be hidden in the new game's vast city — a city featured in a game that will take place 80% outdoors? If reporters are shown a trailer tinged in green that has scenes of a new, nastier Riddler tormenting Batman, what does that mean? A riddle from the past: Why would a Batman game called Arkham Asylum have a few excellent hallucinatory levels triggered by the release of the Scarecrow's fear gas that would let players briefly control a Batman transported into a world of nightmares? A riddle, thought to be a question, asked by me to an Arkham City developer after he showed us that green-tinged trailer: do you guys mean to imply that the Riddler is Arkham City's Scarecrow, that he's the one now pulling Batman into a series of wonderfully-warped side-missions? An answer, which sounds like a riddle, paraphrased: Did you like the Scarecrow levels? A reporter's retort: Are you the Riddler? Why does a man laugh, but not deny? 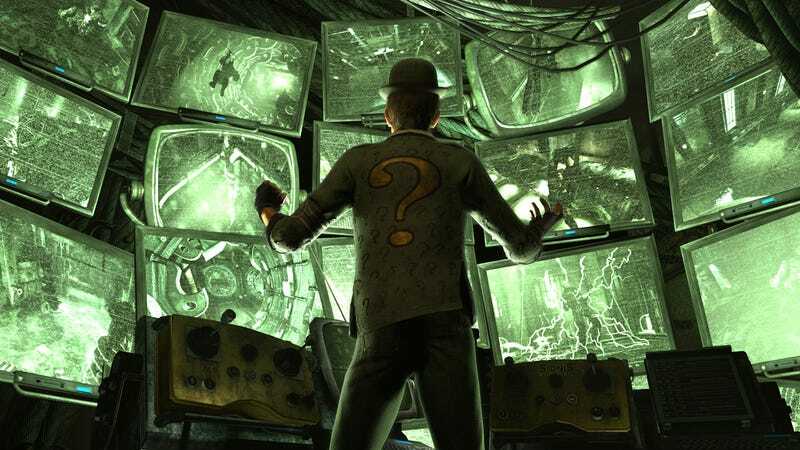 What will be released on October 18 on the Xbox 360 and PlayStation 3 that will surely make this Riddler stuff more clear?